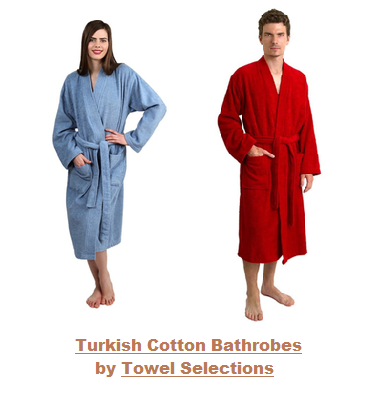 Compare Turkish and Egyptian Cotton Bathrobes and Bath Towels: Which is better? When one thinks of luxury towels and bathrobes, the first thing that comes to mind is those made of either Turkish or Egyptian cotton. Both types are renown to be the best in the world in terms of absorption and softness. But some differences between towels and bathrobes made of Egyptian and Turkish cotton exist, and they should be considered before deciding which type to get. Towels and bathrobes made of Egyptian cotton can absorb more moisture than Turkish towels. That is mainly because they have longer threads, and the density of the threads is quite high. This creates more surface for moisture absorption which is of course desirable. But the down side of this is that the high density of the threads may also trap some of the moisture, and it may take longer for the towel or bathrobe to dry after use. This is not desirable, as towels that do not dry fast enough tend to acquire some unpleasant mildew like smell. So, if you take a shower before going to bed, you may find the next morning your Egyptian cotton towel and bathrobe still a bit moist and not smelling as fresh as you would like them to be. Now when you hold a towel or bathrobe made of Turkish cotton, not only will you right away feel that it is as soft as those made of Egyptian cotton, but you will also notice that they are much lighter. That is because towels and bathrobes made of Turkish cotton have shorter fibers, and they are not as densely packed as those on Egyptian towels and bathrobes. As a result, moisture is not trapped as much, and these towels and bathrobes dry off much faster than their Egyptian counterparts. So, if you take a shower before going to bed, you may find the next morning your Turkish cotton towel and bathrobe dry and fresh as you would like them to be. ​So which type should you get? Clearly, both types of towels and bathrobes are considered luxury products, and you will most probably be very happy with either type. But considering the differences explained above, it is clear that if you want to use your towels and bathrobe while traveling or on the beach, you should definitely get those made of Turkish cotton, as in those situations, you will not have too many towels with you, and you'd want them to dry fast. Also for your home, unless you want to equip your bathroom with a large number of towels (so you can replace them as you use them without having to wait for them to dry), you should definitely get those made of Turkish cotton. That will not only save you some money, as you will not need to buy too many towels, but it will also prevent your weekly laundry from being too large! You will find below our selection of towels and bathrobes made of Turkish cotton. Please click the women's Turkish cotton bathrobe of your choice below for price information or to purchase. Note that various colors will be offered when you click the links below. To order you simply have to choose a color and a size. Please click the men's Turkish cotton bathrobe of your choice below for price information or to purchase. Note that various colors will be offered when you click the links below. To order you simply have to choose a color and a size.